Size 19.5" x 12.5" x 4"
Like the best antique skillets, the FINEX cast iron skillet is polished for an ultra-smooth cooking surface that minimizes sticking and cleaning. Designed with a distinct geometric shape for easier pouring, you’ll like that it means fewer spills and drips. The ergonomic stainless steel spring handle stays cool longer—and cools down faster. We’ve added a ribbed helper handle on the front lip that makes it easy to lift and transfer from stovetop to table. The finishing touch is a beautiful brass cap that makes it easy to hang the pan when you’re done. At-home and professional chefs alike love cast iron for its superior heat retention. The FINEX cast iron skillet’s generous size makes it perfect for searing big steaks, thick chops and substantial salmon fillets, while the skillet’s extra deep walls contain hearty portions. Its thick base heats evenly and prevents hot spots, allowing the cast iron to retain heat even when cold ingredients are added. Its brilliant heat retention bakes perfect cornbread, cakes and muffins. ★★★★★ “I recently purchased the 12 inch skillet with top and it's INCREDIBLE!!! I was worried about eggs sticking to it but after a week keeping it clean and keeping the pan greased with butter it's awesome! This is the last pan I will need during my lifetime. What a piece of art! Thanks for making a great piece of Americana! You guys ROCK!! 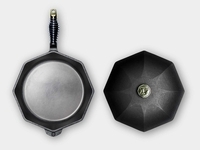 !” - Jason D.
FINEX cast iron cookware comes pre-seasoned with organic flaxseed oil. When you first unbox your new cast iron cookware, give it a quick rinse with warm water and dry it completely. Use a little extra cooking oil the first few times you cook. Over time, your FINEX cast iron will continue to develop a natural seasoning, which will enhance the stick-resistant surface. Our pans truly are searing machines. The thick-wall design provides even heat distribution and retention for optimal cooking performance. It just requires a little patience. Heat it. Sear it. Savor it. For easy cleaning, simply crape off food and rinse using use hot water. For tougher cleaning jobs, use a stainless steel scotch-brite scrubber (or scrubber of choice) to remove the heavy stuff. Use a dab of soap if necessary. Never put your cast iron in the dishwasher or leave it to soak for long periods of time. Once you’ve washed your cast iron and rinsed it thoroughly, be sure to completely dry immediately. Do not “air dry.” Use a towel to wipe it down, or, place your cast iron on the stove and heat over a medium-low heat to ensure it’s completely dry. Warm your cast iron on the stove using a medium-low heat. Then, apply a very thin layer of oil (any vegetable oil you like) and work thoroughly into the pan. Be sure to wipe off any excess. Let it cool and store for your next use. Applying a little oil to your cast iron protects the natural seasoning you’ve worked hard to develop, and it also provides protection against moisture and corrosion when storing. Cast iron is very durable and forgiving. Scorched, scratched, rusted pans? No problem. 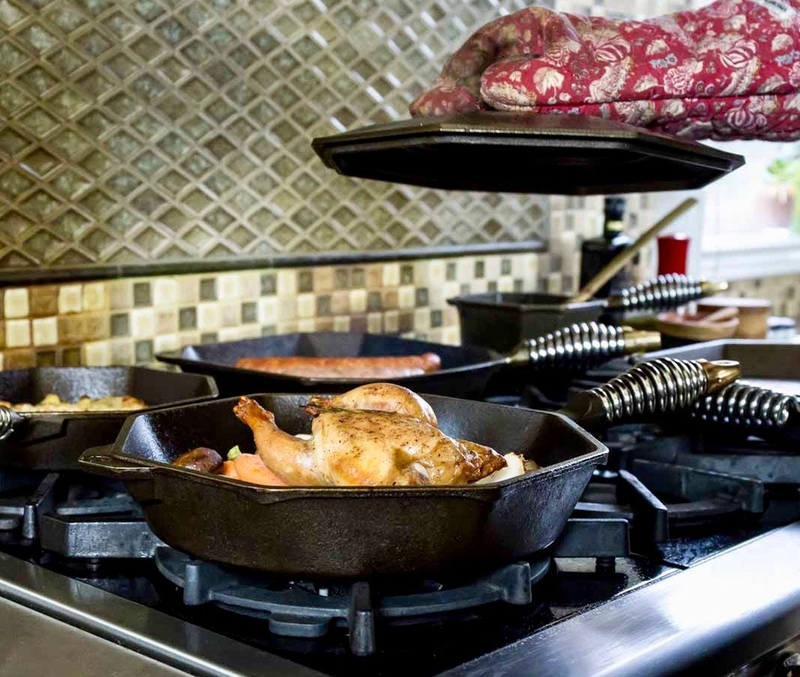 With a little elbow grease and some quality oil, you can completely return cast iron cookware to its perfect working condition. Pre-heat your oven to 400-degrees. If your pan has rust, gently remove it using steel wool. Wash and dry your cast iron thoroughly. Once completely dry, apply a very thin layer of flaxseed oil to the entire surface of your cast iron pan—including the outside surface. Wipe off any excess oil, then place the pan in your pre-heated oven. Bake the pan for one hour at 400-degrees. You can repeat this process to build up your seasoning and maintain the pan for generations. Guaranteed Good Forever—and that includes your happiness. If you’re not completely happy with your FINEX product we'll take it back, no questions asked.